When the guest selects the option for "reservations", the IRM.Net retrieves rates and availability. Google Analytics tracks all pages visited, how long the guest spent on the page, and other information. Promotion Code P1234 A promotion code can be entered by the guest on the IRM.Net or passed. Rate Plan 10DC The 10DC rate plan ("10 percent discount" is used for this promotion). 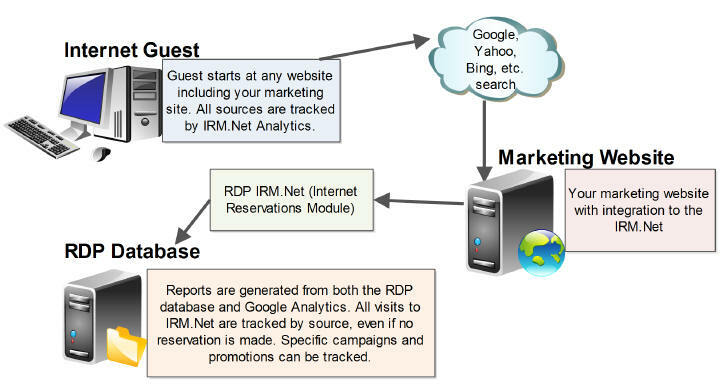 The IRM.Net Analytics & Campaign Management module allows promotion codes to be passed from online advertising to to IRM.Net. For example, you might buy an ad on your chamber of commerce website, and advertise your "Christmas Special - click here to save 10%". This hyperlink can automatically pass the promotion code to IRM.Net, which is then tracked on Google Analytics and RDP source-of-business reporting.